It was maybe not a game you’d have expected much excitement from. The Lightning lead the entire rest of the NHL, by a healthy margin, and haven’t lost in regulation since November. The Flyers, on the other hand, are scraping the bottom of the East and have already canned their coach and GM. But a mismatch certainly doesn’t guarantee a lack of drama, or a lack of highlights. Steven Stamkos and Nikita Kucherov each had four-point nights, but the Flyers overcame a three-goal third period deficit to steal a point before falling 6-5 on an Alex Killorn snipe just 18 seconds into overtime.. It was pretty wild getting there. 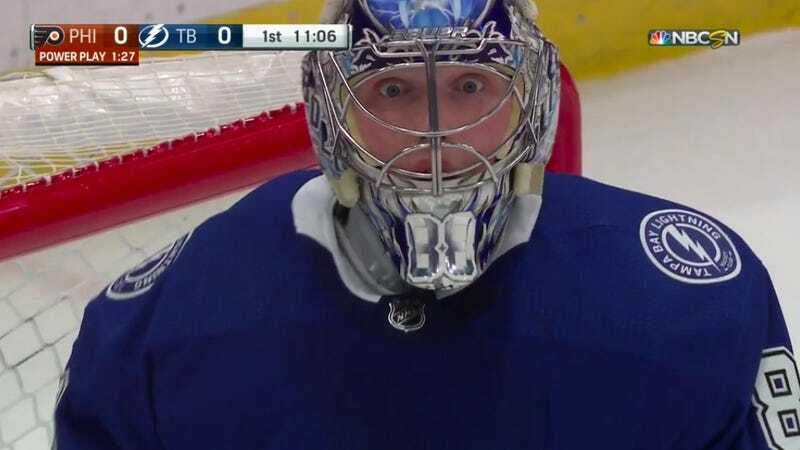 On a Flyers power play in the first, Andrei Vasilevskiy somehow denied Wayne Simmonds from his belly by kicking away a mid-air puck with his heel. “He fights for every puck,” Yanni Gourde said of Vasilevskiy, and I suppose that’s exactly what that truism looks like in action. Vasilevskiy was beatable in this one—he allowed five goals, after all—but on Philadelphia’s second goal, Claude Giroux certainly had to do the work for it. Giroux put on a stickhandling clinic, skating into a 1-on-4 and completely demeaning Ryan McDonagh before having his way with the netminder. A save of the year candidate and a goal of the year candidate both in the same game? Them’s quality highlights.